Apologies for the lateness of the post ... this week has been hectic. The post today is about 'Your Local Area' - I wanted to talk shortly about my actual hometown and not the place I live currently as ... well there isn't much to talk about ... or well I don't know much about the area. I originally come from a small town in South West Scotland called 'Gatehouse of Fleet' in Dumfries & Galloway. It's about 30 miles from Dumfries which is about 40 miles over the border from Carlisle in England ... or it's about 70 miles from Stranraer which takes you over to Ireland on the ferry. > James Murray (an entrepreneur) built his summer home 'Cally' here in 1765 which is now a five star hotel - my Aunty Trisha, Aunty Jacqueline, my brother and myself have all worked there. > Robert Williamson - the renowned inventory of clockwork mechanisms was also known to have setup a workshop here in 1778. 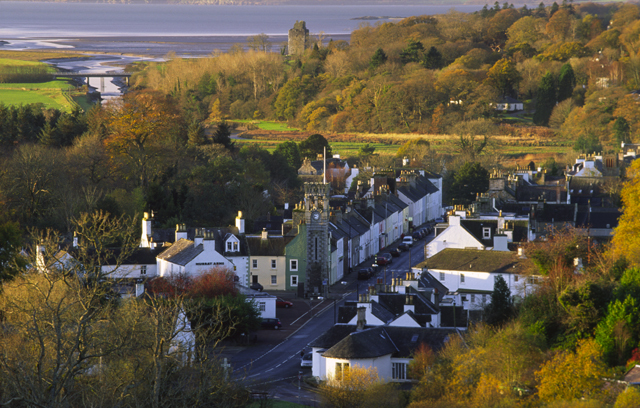 > The name of the town comes from the location - the 'River Fleet' runs through the town and empties into Wigtown Bay just on the outskirts of the town. > The town was also known as a safe haven for travellers to stop so they didn't travel during the night so they could avoid the large numbers of bandits and highwaymen. > Joe Ansbro was raised near the town - for those of you who don't know he was a former Scottish international professional rugby union player. My dad actually works for his Dad's business. > Katrina Bryan who plays Nina (from Nina and the Neurons) was born in the town in 1980. My dad actually works with her father. So lots does happen in my little town or around my little town ... but the slow internet and terrible phone reception don't make me miss it that much. Let me know if you come from a little town or maybe your a big city kid? !